If you want B2B content to be great, across channels you must integrate. 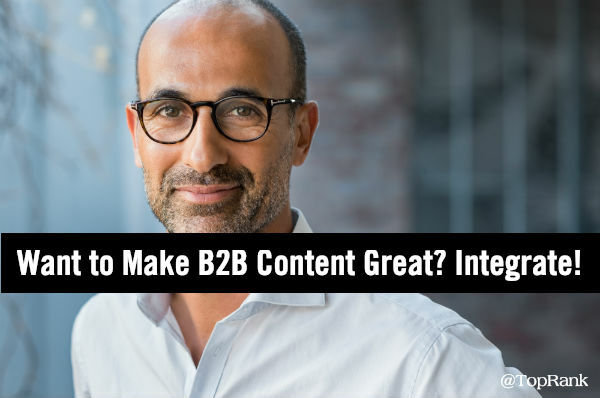 In B2B marketing, the expression “great content” should mean relevant, useful and maybe even inspiring information that connects with the intended reader. The problem is, even when business content fires on all of those cylinders it falls flat if few people ever see it. That’s why business content promotion must go hand in hand with content creation. While the previous sentence makes sense to just about everyone reading it, we also know that in practice, content promotion is more often an afterthought than a key part of content planning. It should be a special case to improve organic search visibility, social engagement, industry media pickups and influencer shares of your content for all the (relevant) world to see, but the standard when it comes to B2B content marketing. “But we don’t have the resources to do that”, you say. I say there’s a solution: Bake core organic content amplification features into the content creation process itself. Speaking of process, there is no getting around the importance of following guidelines in any content operation for translating best practices into action. That’s why I’m sharing a high level checklist for you to see how content, SEO, PR, social media and influencers can fit into an integrated content marketing process. While this checklist is presented in general terms, it’s something that can point you in the right direction for achieving “Best Answer” brand status from of your content investments. Attract: SEO, social, content, ads, email, influencer and earned media KPIs for visibility, awareness, inbound & media placements. Engage: Content consumption and interaction KPIs. Page views, interactions, time spent, shares, social & media citations. Using research to understand customers, competitors and influencers helps guide the appropriate strategy. Audits help you benchmark and understand the gap between your starting point and where you need to be. That insight drives content planning, creation and promotion with the right mix of media coverage, influencer engagement, social network engagement and SEO built in. Of course it wouldn’t be marketing if the right mix of measurement and performance optimization steps were not part of the process as well. Not all efforts to integrate B2B content are perfectly blended on tactics. Some might emphasize SEO and others may focus on influencers, social media, earned media or content marketing campaigns. The key is to understand the right mix for your audience and objectives. Hopefully this broad checklist will give you some ideas on how to optimize and integrate your content creation and promotion to be as helpful for you as it has been for our B2B content marketing efforts. 0 Responses on Great B2B Content Isn't Great if No One Sees It: Here's a Solution"